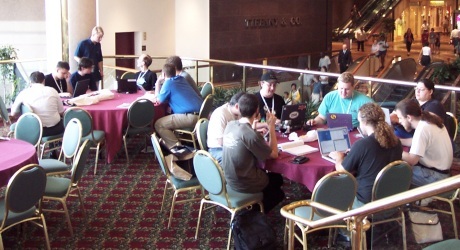 Usenix 2001. Most of the persons seen here are involved in AFS or Arla development. Picture taken at 2001 Jun 28 10:43 local time. Picture data: Kodak DC4800, 100(fake)ASA, 1/10 sec, stop 2.8, 1/3 size and cropped.